The AN300 Nitrogen Analyser is for the testing of nitrogen in vehicle tyres. Specialist applications (large aircraft, motor racing tyres, heavy machinery) use nitrogen as an inflation gas for a number of reasons; the nitrogen permeates through the tyre casing at around a third of the rate of oxygen, which keeps tyres inflated for longer. It also reduces the oxidation caused by oxygen and water vapour, thus extending the life of the tyre, and has a lower expansion rate with temperature, resulting in more even pressures under various conditions. The monitor has a stem for connecting to the tyre valve. 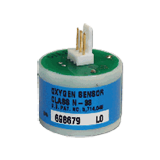 The N-33 Oxygen Sensor for the AN300 Nitrogen Analyser is a maintenance-free, sealed, electrochemical cell that measures oxygen in the gas sample, allowing the analyser to derive the balance of nitrogen. The N-33 has a 90% response in less than 10 seconds. Warranty: 12 months from date of invoice against defects in materials and workmanship.